We've spent a fun weekend celebrating Mr. G's birthday, playing a bunch, and eating a TON of food. I think we've eaten at most of the chicken and BBQ places in this county and the one next to us. I've been recovering all day and dosing myself with Mucinex and Halls cough drops too. Not quite so fun. And at some point this weekend, the little man blossomed into a little conversationalist. He is definitely his mother's son. Oh I hope I can get some video footage up on this blog for posterity's sake. Several months ago, I had my hair done at a place called The Dry Bar in Highland Park. It's this fabulous concept of a blow out with the convenience of a manicure or pedicure. It's a chain, so there might be one near you. You can make appointments online (recommended) or just walk in. It's truly fabulous with adorable decor, and it's especially great if you have a fun event for which you're primping. Or even if you don't. Anyway, they used some of the products from the Living Proof Full Thickening line on my hair, and I loved it. So, of course the next day I ran out to try some for myself. I bought my can of Living Proof Full Thickening Mousse at Sephora. It's amazing. And I say that with all due respect to the word amazing, which is completely overused. It goes on while your hair is still wet from root to tip. I use quite a bit--maybe two egg sized dollops. You will feel it giving your hair texture in a kind of "oh my gosh my hair feels disgusting I'm gonna have to wash it again what was I thinking listening to that dumb blog" way, but when you blow it dry, it doesn't look like you have greasy product in your hair. I promise. And then it backcombs to high heaven. Happy Teasing! See more Things I Recommend to My Friends here. 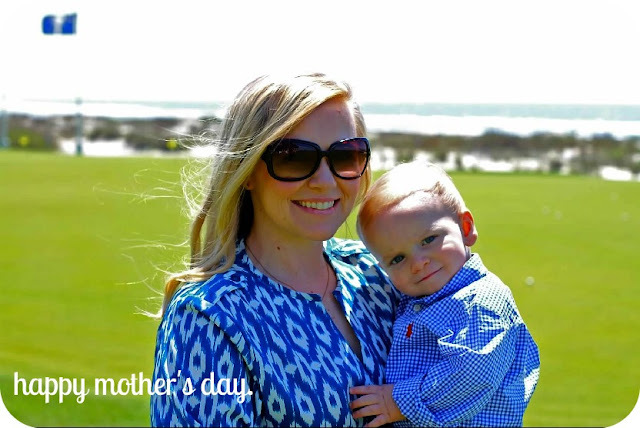 Note: I completely forgot to add on my Mother's Day weekend post that the picture of my sweet boy and me was taken by the lovely Jenni. Please forgive me! I know I'm getting older since I'm beginning to understand why my parents didn't always want to "go somewhere" on the weekends when I was younger and wanted to be anywhere but home. It's finally become enough for me to just be and enjoy the home that my husband and I have made and to enjoy being with my little family. I don't need the mall; I don't need an exotic locale. I just need time to spend with the people I hold dearest. That being said, this past weekend was filled with exactly that: time to spend with my boys. No planned activities except for church on Sunday. We filled the weekend with snowcones, ice cream, eating at home, date night, and fluffing our happy little domicile. And I finally got that quiche I missed out on Mother's Day. Bonus. First up, date night. It has been a joke of ours that each parents' night out, we end up spending the last 45 minutes in Target, usually shopping for our child. Friday night, we broke with tradition and ended up in Dillard's of all places, doing a little shopping for Mr. G's birthday. While he browsed, I tried on hats. I love hats and have quite a few at home, and I wear them exactly never. 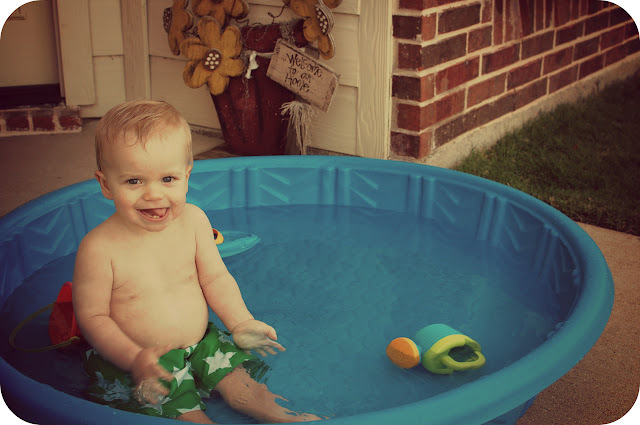 Next came Saturday, where we filled up the baby pool and let the little man splash around. He loved it, of course. We slept until 8:30 that morning. Glory hallelujah, Amen. I do believe summer days are officially here. Yesterday my ball, glove, and yes, even shorts matched my golf bag. 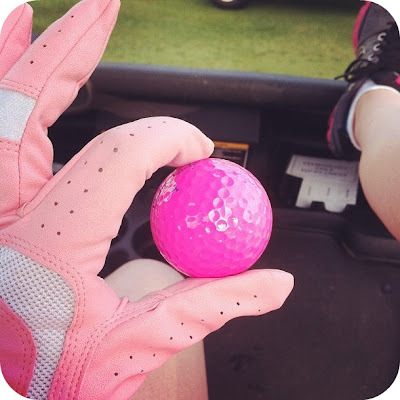 I have no shame in my pink golf game. I think I've chronicled on here enough that my husband loves to golf enough that you get it. But yesterday I carried my own clubs out for the very first time to participate in a golf scramble with the folks at my office out at Bear Creek. All for charity, of course. The funny thing about it is that I've had my very own set of golf clubs since Mr. G and I married. As a good wife who wanted to spend quality time with her husband, I had decided I wanted to become proficient in the game back in 2005. We hit the driving range several times. I even got a super fancy hot pink Titleist bag for my birthday that year to carry my $50 "Classic Lady" garage sale clubs. Those clubs served me very well. Them, and also this fancy one called a "hybrid" Mr. G let me borrow that in all honestly was probably worth more than the rest of my equipment combined. As I left, he instructed me to NOT lose that club. We even played my ball a few times. (In a scramble, everyone hits, and whoever has the best shot--you use that ball.) But to be most fair, the 3 gentlemen on my Team were very nice throughout the 5 hour round. And we've worked together for 10 years (ten years!!! ), so it's almost like family. It was fun enough that I admit I would repeat it sometime, that is, if I can ever lift my arms again. Oh, and a girl will need shoes, of course. I think Mr. Gentry might even be a little impressed. 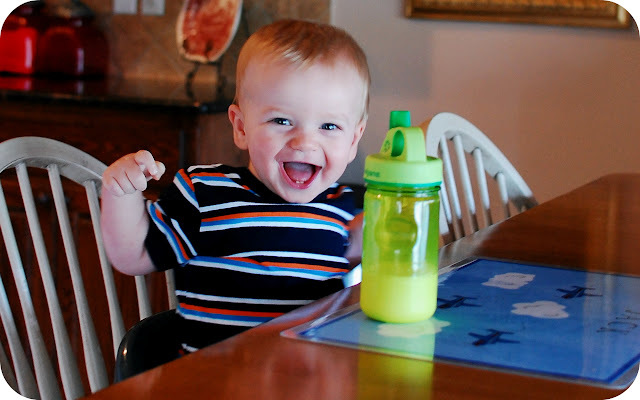 I recently bought Jack this great booster seat for our dining table. We have one of those higher dining room tables (somehow it works really well for a tall husband/short wife combo), and Jack's high chair wasn't quite high enough to pull up evenly. Now that he's doing really well with table manners, it was time to join us at the table. 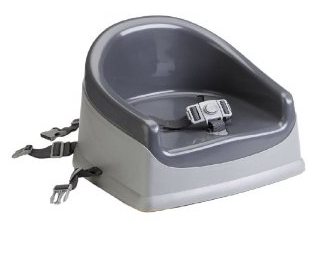 This is the Prince Lionheart boosterPod from Amazon in charcoal grey. The only reason I chose it was because it's charcoal grey. If the $15 one at Wal-mart had been a great neutral color instead of bright red Disney's Cars, then I probably would have that instead. It was super easy to install, and it blends well pushed under the table. So this reminds me of a time that I was totally mommy-judged for seeking out ways to camouflage baby items. I said something about not wanting my house to look like a toy store which was not well received. Yep, a child lives here, but he doesn't pay the mortgage. Therefore, toys are picked up and put away at meals, naps, and night, and they are stored in baskets that match my living room. I promise I don't stifle his creativity! I have more pictures of myself with my mouth open since this kid came along. This is us saying, "Yay!" I've had an exhausting mother's day weekend! We saw my in-laws, my parents plus much of my extended family, and spent today catching up around the house. And I learned a lesson about Mother's Day in Fort Worth, Texas. If you want quiche (and what mother does not want a little quiche on Mother's Day?) then you must make a reservation like, two weeks before the day. That being said, I will be eating quiche next weekend instead. But for Mother's Day lunch I had Joe T. Garcia's so I really have no room to complain, since it's my favorite. 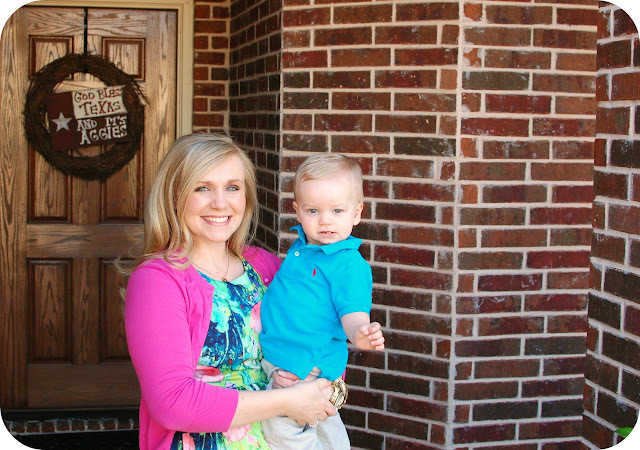 I signed up for worship care in the nursery for Mother's Day about a month ago. So after Sunday school I headed down to play with Jack's class. No better way to spend this day in my book than loving on my boy. We had a good morning. He is in the stage where he can't get enough of me right now, and I love that. I stand by my comments from a year ago, that being a mother is even better than I thought it would be. It is truly a blessing from the Lord. I love, love, love being Jack's mama. And he loves eating my guacamole. Next time, we're ordering double. So, if we were still in college, we would consider Thursday night as the start of the weekend, which in my book means that Mother's Day weekend is well underway. Here's hoping your weekend is full of all the things you love! This post has been swimming in my head from a couple of conversations I've had with experienced working mother friends and new working mamas over the past few weeks. 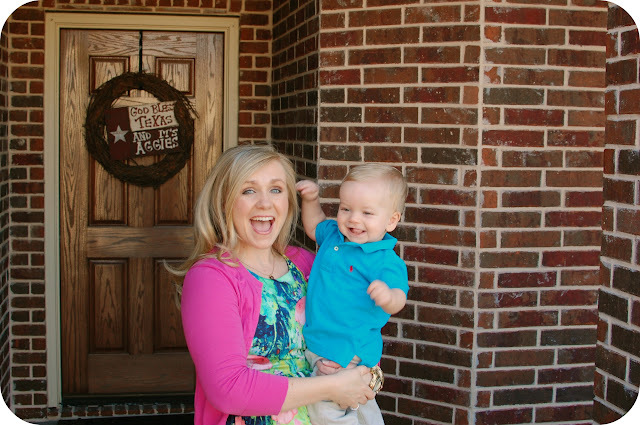 Back when I had all the answers on parenting (you know--prior to actually being one), I made several assumptions about myself and about what being a mother would actually look like. 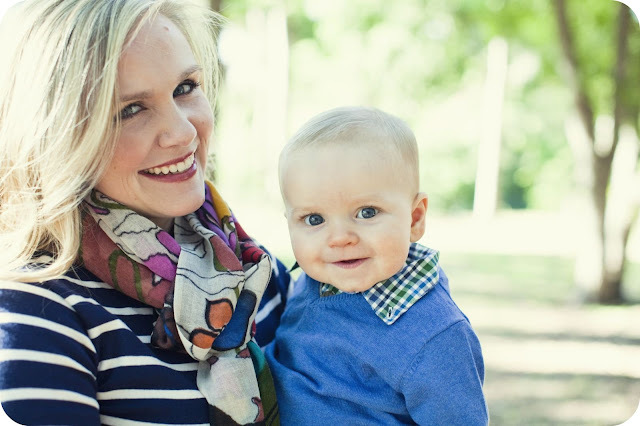 One assumption prior to being a mother is that it would get easier with practice. That is, in fact, false. It doesn't get easier--it just becomes the new normal. What do I mean by this? I just thought I was good at multitasking prior to motherhood. Now, between the baby, the husband, and my job, I realize I'm just now understanding multitasking. As I review some of my day's accomplishments, I realize that the only way I managed all those tasks was the Lord blessing my time. No, seriously. It can only be the Lord. It blows my mind. For example: how did I have time to play with the boy, blog, keep the house picked up, and the laundry on schedule, plus I made dinner? After working 9 hours today with a doctor appointment on my lunch hour? Mystified. 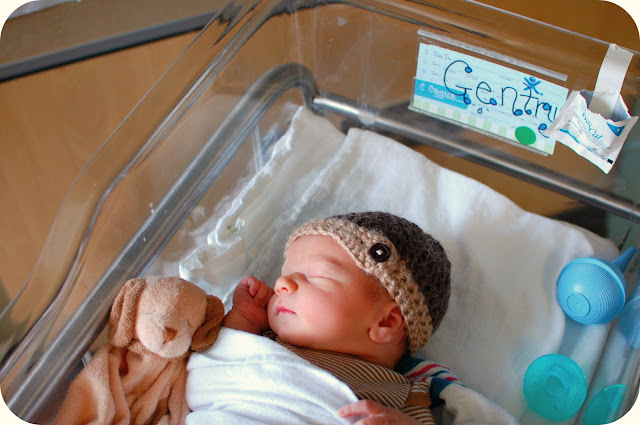 Also, I think I underestimated the cuteness factor of my kiddo, or maybe I overestimated my own stoicism. (See also: tears that come to my eyes at the drop of a hat, post-baby. I rarely cried pre-baby.) I just thought he was cute when he couldn't do anything but lift his head up off the play mat for 1 minute. Now that he's mobile, he's talking, he's mimicking us (oh my gosh, cuteness factor off the charts), and he's especially reaching for "ma-ma", it's so, so hard to leave him every day. I'm imagining that there is this double bell curve of missing your child. It climbs until the terrible twos, then experiences a dip, and starts to climb again around the 3 or 4 until maybe age 13. I have no idea though. I'm just making that up. Maybe it won't dip ever, and when mine graduates high school I'll have to go with him to A&M and study for some Masters degree. Am I alone in this? What's your experience? This past Saturday, we roadtripped with friends down to College Station, home of Texas A&M University which is also known as Aggieland for those of you who may be reading this and are not from the great state of Texas. 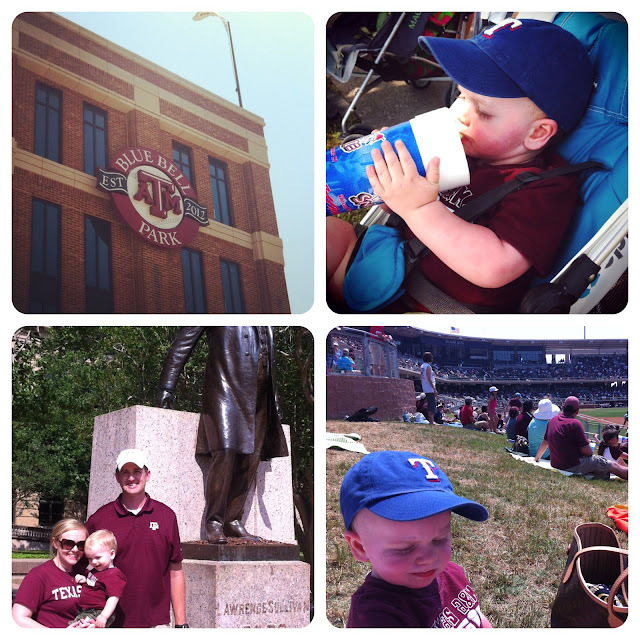 My husband and I both went to school there, and we laugh (but really, we're serious) that Jack will be class of '33. Baby's First time to sweat and Baby's First snowcone. A&M just conceded to its first sponsored stadium this year with the renovation of our baseball field. 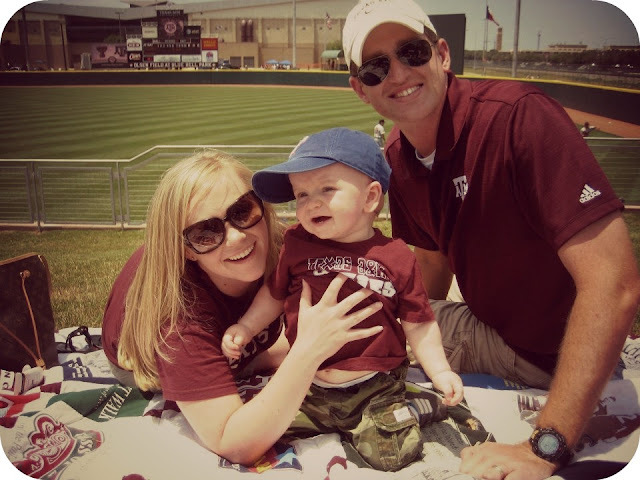 It's now known as Blue Bell Park at Olsen Field. At first, I was a bit outraged that something as sacred as Olsen Field would be sacrificed to the almighty dollar, however my first impression this weekend was that Olsen Field is just a better version of itself. And honestly, if you have to be sponsored by a corporation, what's more down home than Blue Bell ice cream? Very well done. Anyway, it was so fun to drive around College Station and stroll through the campus. I made my best friends and many wonderful memories there. God prepared me for adulthood there, with a good education, and He revealed more of how to walk with Him there. It is a place to remember His faithfulness. And it was so good to be back on those sidewalks again. The renovations we saw (and we checked in on the "new" MSC, my Aggie friends) are simply making A&M a better version of itself. Love that. And funny enough after all that reflection, today was senior Sunday at our church. We had a breakfast, recognition ceremony, and lunch. I've mentioned a few times that I teach senior girls, so it was kind of a bittersweet day. It's exciting to see them prepare to take the next steps into life. There is a whole world at their fingertips! I also got a tiny bit emotional, which I rarely did before I had Jack. What is up, tear ducts? Only 17 years with my boy left. No doubt he'll think they are long, but I'm convinced they won't be long enough. So I found out this afternoon that my son can crawl up on the hearth. He turned around and sat criss cross applesauce (I guess that is the politically correct way to say that sitting position now) and looked at me like, "What? This is how I always watch TV." No, Son. No, it is not. So anyway, that was a big first for me. Climbing. Also, it is difficult (if not impossible) to work from home if someone cries each time you pick up your laptop. I downloaded Insurgent today, but as I am currently re-reading Mr. Darcy's Diary (on the Kindle app, seeing as how I am currently addicted to e-books), it'll probably be next week before I get to it. I have a hair appointment for Friday. This is great because 1. my hair is a bit long right now and 2. fluorescent lights do not have the same lightening effect on hair as they do on colored paper. (If you work in an office, that's an experiment you should try sometime if you have not.) Fortunately, my hair is a shade that my roots don't show all that much. At least that is what my stylist tells me, and I choose to believe her. I will probably ask her another annoying question about dry shampoo. Standby for an update next week. My car is in the shop. I'm driving a practically brand-new one. The new car smell is incredibly tempting. But I love my current car. It's probably the best car I've ever owned. I don't want a new one. Statements like this make me feel very mature and responsible, which is funny since I just ate icing from a can as a snack. Please tell me you do this too. Such a riveting life I lead. Happy Wednesday to you, friends.